The Chronic Care Collaborative (CCC) is coalition made up of 34 advocacy organizations representing Coloradans with a range of chronic conditions. The CCC works to improve access to quality, affordable, and integrated health care. Project Summary: Member organizations of the CCC are each receiving customized drug dashboards, populated with CO APCD data specific to the drugs that their particular condition most rely on and utilize. These interactive dashboards display show how much Colorado is spending for certain prescription drugs and whether prices are going up or down for health plans and patients. Benefit to Colorado:The graphics below show the member liability (patient responsibility) trends for one drug being evaluated by a CCC organization between 2012 and 2015. 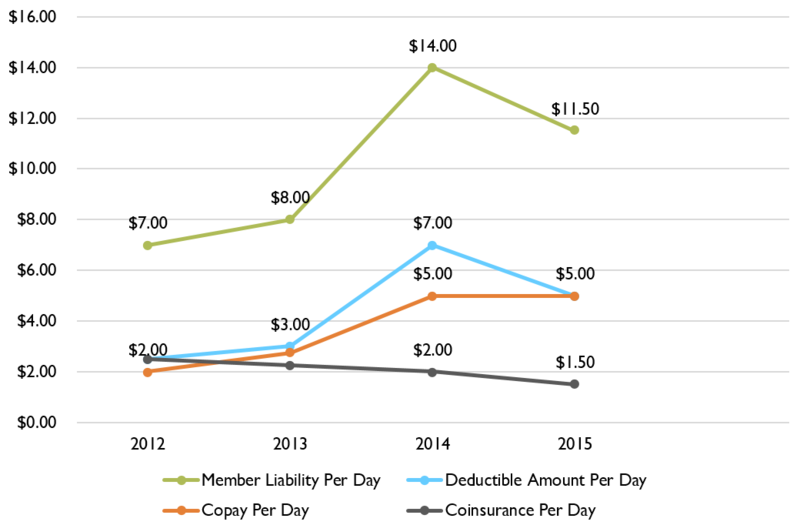 Member liability (total payments made by patients), deductibles, and copays are all trending upwards from 2012 to 2013. 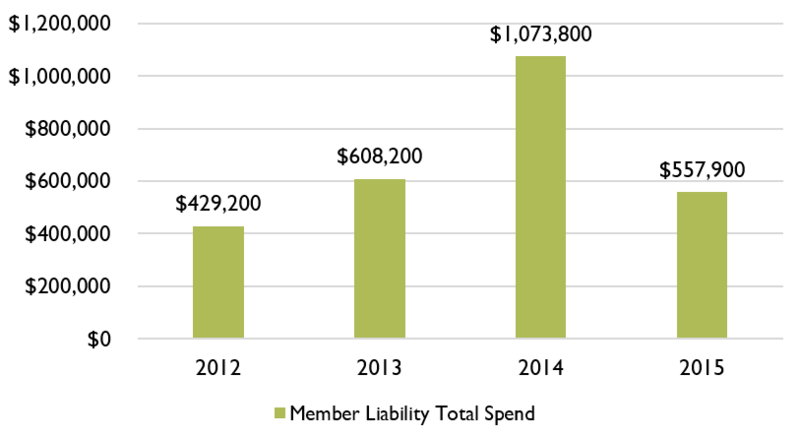 Member liability drops in 2015 but still hovers over $4 more per day than in 2012. Coinsurance per day, however, trends downward during all four years analyzed. This type of trend information helps CCC assess whether costs for their constituents are going up significantly, thereby negatively impacting the patients’ ability to receive the drugs they need. The CCC organizations plan to use this information to advocate for policies and legislative changes that can lower or reduce the cost burden for patients with chronic diseases, ultimately leading to better health.